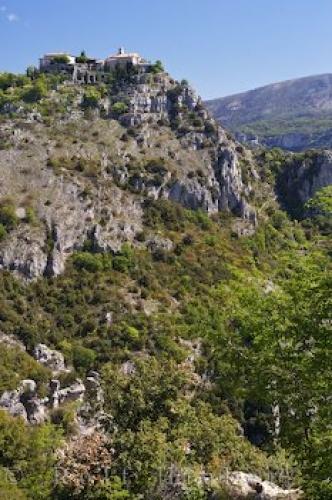 The cliff top village of Gourdon atop a peak in the Gorges du Loup in Provence, France. Gourdon in Provence, France is one of the famous little villages found clinging to the top of the cliff at 500 meters, looking straight down to the Gorges du Loup. The Loup River begins in the Pre-Alps and winds its way to the Mediterranean Sea.Gourdon is an ancient feudal village dating from 1035. The chateau is one of the places to see when visiting Gourdon in Provence. Between the 9th and 12 centuries it was a Saracen fortress, but during the 13th century it became a chateau. In 1610 it was entirely rebuilt by the Lombard family.The views from Gourdon in Provence, France are spectacular, one can see all the way to the Mediterranean coast and the Esterel Mountains and it is not hard to understand why Gourdon is also called the 'Eagles' Nest'.Village of Gourdon, Village Perche, on the a rocky cliff, Alpes Maritimes, Provence, France, Europe. in Provence, France in Europe.